This book offers a comprehensive evaluation of community care strategies within the context of government social policy, and assesses the recent shifts of political power from Conservative to Labour towards the end of the century. 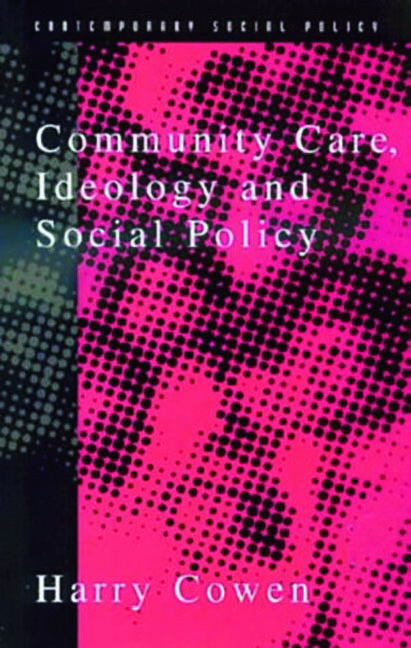 Unlike the majority of texts in the field of community care, it makes explicit the historical, philosophical, social and political inter-connections, and therefore provides an in-depth understanding of changing policy issues for students, practicioners and managers in health and social care. 1. Community, Policy and Ideology. 2. A History of Community Care. 3. Health Services and Community Care Policy. 4. Social Services, Community Care and the Market. 5. Elderly Persons and Community Care. 6. People with Disabilities and Community Care. 7. Mental Health, Homelessness and Housing Policies. 8. Women and Community Care. 9. Minority Ethnic Groups and Community Care. 10. Citizenship, Participation and Community Care.